Wilderness First-Aid with CPR-C in Tofino - May 2019 West Coast N.E.S.T. This fun and interactive wilderness first-aid certification course is a must for anyone working or playing in remote locations away from medical aid. Students will practice both first aid and decision making skills in realistic outdoor scenarios. 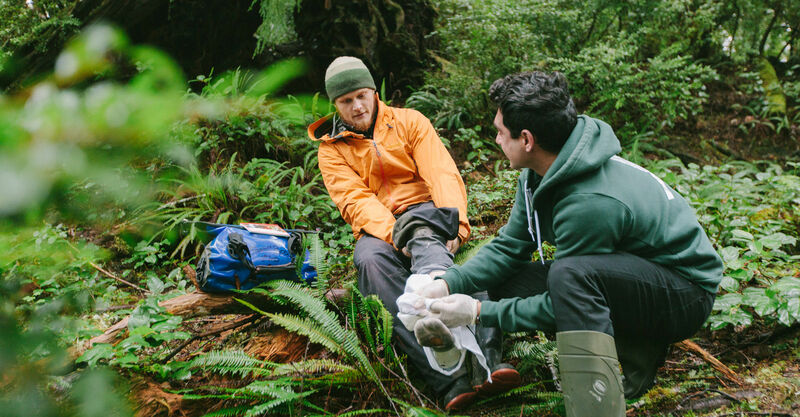 The Wilderness First Aid course is a three day certified course in Tofino. This course takes place over 3 days; Friday evening to Sunday. Only the Friday evening portion (CPR portion) of the course takes place inside. The rest of the course is run in the field with a focus on hands-on experience. Students will learn and practice; spinal immobilization, building splints, building stretchers, carrying patients in a stretcher over rugged terrain, treating hypothermia, re-aligning fractures and dislocation as well as a variety of other wilderness rescue procedures. Red Cross instructor Emre Bosut, co-owner of T’ashii Paddle School brings 17 years of outdoor industry and instructing experience to T’ashii’s wilderness first aid courses. With a background in whitewater instructing and guiding Emre has worked around Canada and internationally as a guide in mountain, river, and surf environments.